Heat oven to 425°F. Line cookie sheet with parchment paper. Remove crust from pouch; unfold crust. Place on paper-lined cookie sheet. Press out fold lines. In large bowl, combine all filling ingredients; toss to coat. Spoon filling evenly onto crust, spreading to within 2 inches of edges. In small bowl, combine 1/4 cup flour, brown sugar and butter; mix well. Sprinkle mixture over filling. Fold edge of crust over filling, pleating crust to fit and leaving about 5 to 6 inches in center uncovered. Brush crust with milk; sprinkle with 1 tablespoon sugar. Bake at 425°F. for 10 minutes. Reduce oven temperature to 350°F. Sprinkle almonds over filling. Bake at 350°F. for an additional 20 to 30 minutes or until edges are deep golden brown and fruit is tender. Immediately loosen tart by running pancake turner under crust; place on wire rack. Cool 30 minutes. Serve warm or cool. 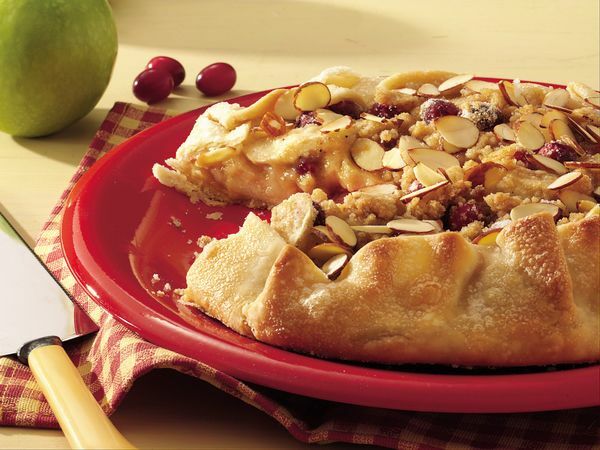 Instead of combining apples and pears, try this recipe prepared with either all apples or all pears. Substitute the nutmeg with your favorite spice; try cinnamon, ginger or cardamom.